This section follows on from Part 1 – Estonian Bronze Spiral Tube/Coil Decorations and Part 2 – Siksälä Wreath Headdress Tails. Siskala Wreath Headdress in progress, as displayed in the A&S area at SCA 50 Year Celebrations (Midrealm). Work in progress by Ceara Shionnach, photo courtesy of Morgana Krinsley, June 2016. In the sources I’ve observed, bands vary between 1 (e.g. page 21, Valk et. al, 2014) and 4 bands (e.g. page 122-23, Valk et. al, 2014) stacked and joined with stitching (ref) and/or jump rings (ref). The individual bands vary in width (from my attempted measuring of sources in Valk et. al, 2014, approximately 1-3cm), and include a protrusion of several centimetres out the back from which the tails hang (as evident in the extant headband on page 39 of Valk et. al, 2014 and the reconstruction on page 44 of Rätsepso, 2014). 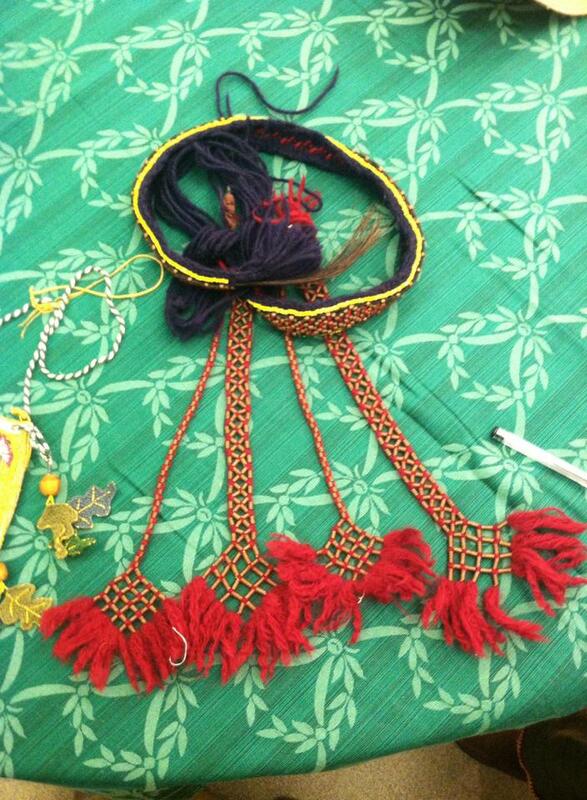 Opaque, yellow glass beads are used to outline the patterns on the headband (Valk et. al, 2014; Rätsepso, 2014; Rätsepso, 2013; Rammo 2005). Looking through the various finds for inspiration, I decided to make a headband made of 2 stacked bands (as the examples on pages 39 and 40 of Valk et. al, 2014 appear to be) that are approximately 2.5cm in width each (which also happens to achieve a similar combined width to the multi-band headband on page 75 of Valk et. al, 2014). Tablet weaving was a technique used in Estonia (including Siksälä) in the 14th century, with many examples of decorative tablet woven edges on shawls (e.g. pages 60 and 83 of Valk et. al, 2014) and the wreath tails themselves (e.g. page 84 of Valk et. al, 2014). The only sufficiently detailed information I could find about how the woollen bands used in the Wreath Headdresses were made was by looking through the images of Rätsepso’s reconstruction (2014), which she created after studying extant examples in person. Thirdly, the close-up photo of what appears to be a headband on page 141 (1. Peapärja võruosa kand (AI 5101:CCXLVII-B:2)) of Rammo 2005 looks to be tablet woven wool with no coloured pattern woven in. These three points demonstrate that this weaving style is a plausible approach to making the bands, and so I chose to tablet weave my bands as well. In terms of colours of wool used, of the 50 wreath headdresses found, reddish tones are the most common – however, bluish hues (Valk et. al 2012) and yellow tones have also been found (Rätsepso, 2013). Furthermore, in Rätsepso’s reconstruction of a Siksäli Wreath Headdress (Rätsepso, 2014), blue and red wool is woven to make the headband. As such, I chose to weave my headbands from blue wool. My first ever attempt at tablet weaving. It took me probably 5ish hours from warping the loom/cards to weaving the band. Unfortunately, I hadn’t made the strands long enough and ended up with a band approximately 3cm too short for what I needed. Also, the edges were rather wonky. I am, however, proud of it as my first self-taught attempt. First self-taught attempt at tablet weaving, complete with Bella Cat. Photo and weaving by Ceara Shionnach, 2016. I thought, perhaps, some of the reason the band looked chunky was the thickness of the wool I was using. Unable to source a dark blue in a finer ply, I decided to halve the 8-ply dark wool I had on hand. It took approximately 3 hours to halve the ply and warp it up onto the loom and cards. Unfortunately, I was still having issues keeping the weaving straight and even – but, TH Baroness Hróðný Aradóttir gave me a piece of advice that I wanted to try. The idea was to use a metal ruler as the beater, and to measure the width of the band as you go to keep it at the desired width. When I tried to undo the weaving to start again, the warp threads frayed too much and began to break. And so, resigned to having to warp up the loom and cards again with fresh wool, I stopped this attempt and began again. Second self-taught attempt at tablet weaving. Photo and weaving by Ceara Shionnach, 2016. Mistress Marion de PaxFord gave me advice on how to better use the loom – turns out I’d been using it backwards and without one of the pieces, lol! Third self-taught attempt at tablet weaving. Photo and weaving by Ceara Shionnach, 2016. Taking into account the advice I had been given and the experience I had first-hand built up in my first three attempts, I began attempt 4 using 12 cards of 4 warp strands of 8-ply dark blue wool that were approximately 3 times the length I needed for the finished band. I was rather pleased with the result – much straighter, more even, and less twisted bands of appropriate length to go around my head circumference with an approximate 2cm overlap at the back (2 bands of 2.5cm wide and approximately 62cm long). The decorations for my headband are primarily based on the finds detailed on page 40 of Valk et. al, 2014, and page 123 of Valk et. al 2012. Using the measurement key, I estimate that the coils in this image are 2.5mm in diameter and 4mm in length (4 rotations per coil) and the beads are approximately 3mm in diameter. I sourced the wire and made the coils in 20 gauge bronze in the same manner as described in Part 2: Siksälä Wreath Tassels. I obtained 3mm yellow glass beads from the ebay store treasuresgalore. I used a larger mandrel to make the coils for the headband total approximately 2.5mm in diameter. Using published patterns (drawn clearly from finds in Rätsepso 2013) I wove the coils into natural black horse hair obtained through a Fishpond store. I used plaiting schema C from this figure published on page 25 of “MUINAS- JA KESKAEGSED PEAPÄRJAD SIKSÄLÄ KALMISTULT” (Signe Rätsepso, 2013). Again finding inspiration in the clear, progress photos of Rätsepso’s reproduction piece (2013), I couched the coils and horse hair matrix onto the woven bands as I went, using red 8-ply wool. You can’t tell the colour of the threads, but there are couching stitches evident in some of the close-up photos showing the stitches holding the horsehair to the band (Valk et. al, 2014). The pattern is relatively simple 4-part pattern – starting from the left side of the image below, there are 2 spirals, 4 spirals, 3 spirals, 4 spirals. In between the columns with 2 spirals, a single couching stitch is made. In between the columns with 3 spirals, 2 couching stitches are made. This pattern is repeated until you get to the end. For a clear drawing of the pattern (including the movements of the horsehair), see Rätsepso 2013. The beginning of the pattern woven using horsehair, bronze coils, and red wool. Photo and weaving by Ceara Shionnach, 2016. Lastly, I sewed the beads in lines bordering the patterns using backstitch. I had no evidence for which stitch to use here, however, I chose backstitch because it (and similar variations, e.g. 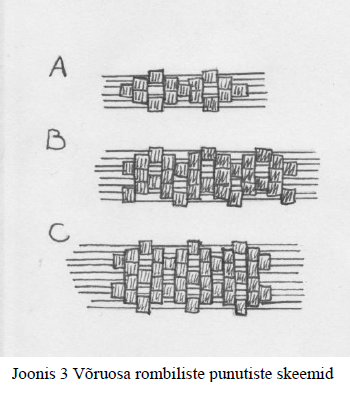 stem stitch) is found across many cultures and time periods. The finished pattern of band 1. Photo and weaving by Ceara Shionnach, 2016. Rammo, Riina (2005). PRONKSSPIRAALKAUNISTUSED RÕIVASTEL EESTI HAUALEIDUDE PÕHJAL 11. – 14./15. SAJANDIL (Bronze decorations grave finds of Estonia’s clothes based on 11-14/15th century). Published by the University of Tartu (Estonia). Rätsepso, Signe (2013). MUINAS- JA KESKAEGSED PEAPÄRJAD SIKSÄLÄ KALMISTULT Seminaritöö (Ancient and Medieval Cemeteries of Siksal Wreaths Seminar). Tartu University Viljandi Culture, Native Crafts Department, National specialty textiles. Rätsepso, Signe (2014). REKONSTRUKTSIOON SIKSÄLÄ NAISTE PEAPÄRJAST Diplomitöö (RECONSTRUCTION OF SIKSAL WOMEN’S HEADDRESS, Diploma). Tartu University Viljandi Culture, Native Crafts Department, National specialty textiles. Valk, Heiki, Kama, Pikne, Rammo, Riina, and Malve, Martin (2012). The Iron Age and 13th-18th Century Cemetery and Chapel Site of NIKLUSMÄGI: Grave Looting and Archaeology. Published in Archaeological Fieldwork in Estonia 2012, pp 109-132. Valk, Heiki, Ratas, Jaana, and Laul, Silvia (2014). Siksälä kalme I, Matuste ja leidude kataloog (Siksälä mound , uncertainties and findings directory). Published by the University of Tartu (Estonia).